Tested. 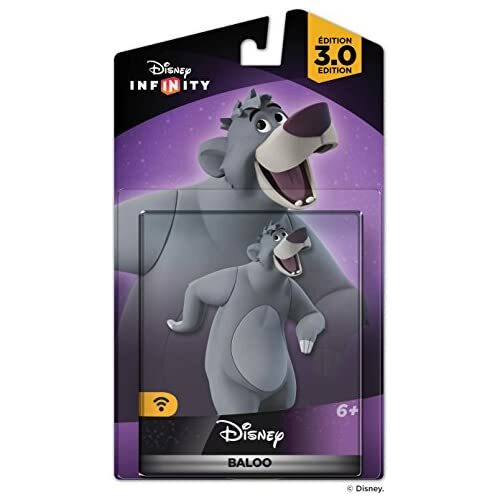 Includes disc, case & artwork. **DLC & manual may not be included. **Disc is clean with very light to zero scratches. Everything shows very light to zero signs of wear. **Is free of writing, cracks, residues, and other major defects. Sold by Voomwa and fulfilled by Amazon. Just Dance 2015 is the latest, most awesome-filled version of the world's #1 dance game! 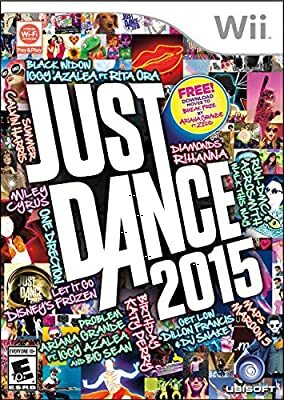 Bringing new moves and game modes to over 40 top tracks, Just Dance 2015 features hit songs like "Maps" by Maroon 5, "Bang Bang" by Jessie J, Ariana Grande & Nicki Minaj plus legendary favorites like "Walk This Way" by Run DMC & Aerosmith. 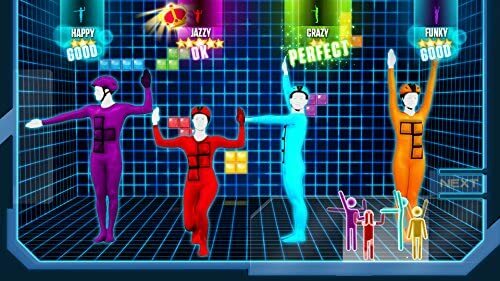 Online multiplayer is back: With the World Dance Floor feature, dance with anyone anywhere in the world in Just Dance's exclusive online multiplayer mode! Q: Does this version have any unsuitable language for children? Q: Will the game include Katy Perry's hit song, "Dark Horse."? 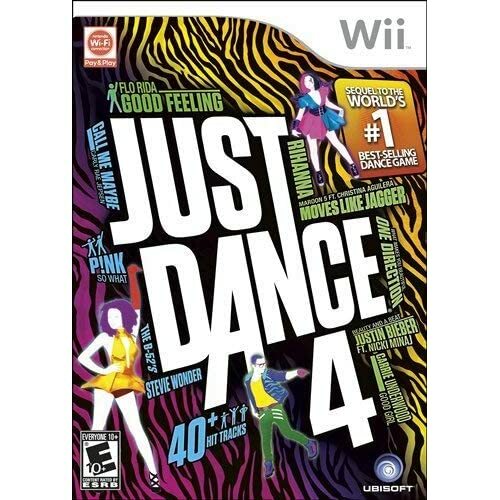 This is a game designed for adolescent girls at sleepovers who want to do a group dance or video. If you're an individual, you're on your own here. You are extending your arm to dance with imaginary partners. You're also standing still while the other dancer does his/her "thang." Not great for a workout. I've lost 50 pounds thanks to Ubi Soft's Just Dance. I don't think I'll lose another ounce with this version. Why? If you select the calorie/time counter and random selection, THERE IS NO WAY TO SKIP SONGS. Just when I wanted to get revved up, the game switched to the best of 1952 with a slow song, followed by an R&B song which should be played during a breakup...not a workout. Oh--and that beautiful but annoying song from "Frozen"? Listen, Ubi Soft: LET [THAT] GO. Not needed here. I know I'm a princess; I don't need a workout in which the character is dressed as one. Also, because this is so heavy on the group element, you are unable to dance for at least 30% of each song. Ubi Soft keeps pushing the community element. Listen: I'm not pretty when I exercise, nor do I wish to look great. I don't need a creepy guy living in his mother's basement looking at me dancing. After every four songs, it keeps jumping to the options to record/play challengers/etc. Sorry, creepsters: You'll have to get your kicks elsewhere. - The directional moves on the bottom right-hand of the screen have not improved. - They have most of the same characters doing the same moves, only to different songs. I paid $40 for a compilation of Just Dance versions 1-5. Again, unless you're a 12-year old girl at a sleepover, save the $40. I own at least 4 other Just Dance games and my sister has several of the ones that I do not so I have played this many, many times. This one seems like the creators a) couldn't come up with new dance moves for several of the songs and b) they tried to make up for a) by adding all kinds of weird graphics that make it harder to see the characters. As a whole, this is 3 stars at best. 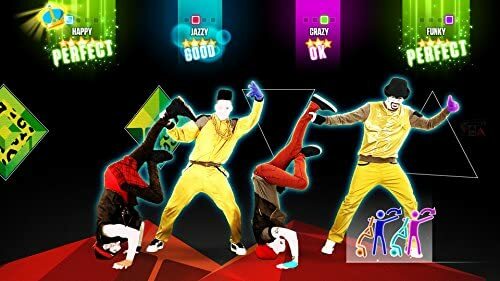 There were at least 2 songs that had moves so similar to other productions of this game that I was having deja vu ("Burn" vs. Just Dance 4 "Maneater" is one). All that to say, I wouldn't pay full price for this as you are getting rehabbed dance moves. You would think after so many of these had been produced, they could finally put real "people" on the screen like Zumba World Party but apparently not. I have played every version of Just Dance released for Wii. 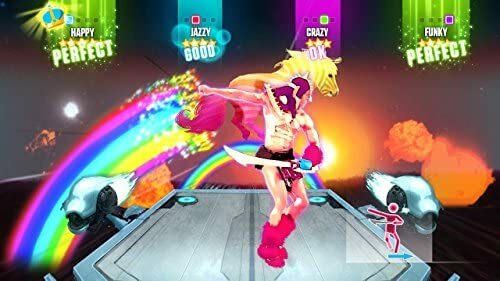 While they have definitely made improvements as new editions come out I find that I like earlier version aspects better, such as the workout mode found in Just Dance 2 that allows you to see how much you "sweat." Overall the songs in this version are great, true to Just Dance form with classic songs and current hits (current being 2014). You are also able to unlock different versions of songs/dances as you go along which is not a super exciting edition in my opinion but interesting. 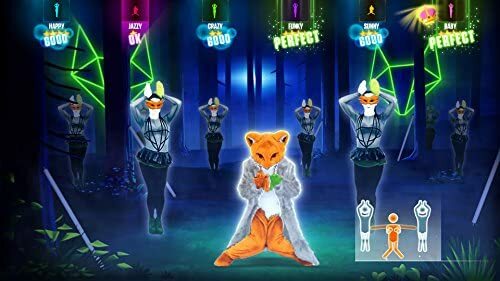 Overall, if you like previous Just Dance games or if you like to get a good workout while playing Wii games I definitely recommend it. I think the idea of the program a lot. I have fun doing it! However, I feel like moving from song to song can be glitchy and isn't exactly what I expected. The song choices are fun. I also since I haven't played the just dance series of games found the shows of future moves to be a little confusing. All in all is a fun game and I don't regret buying but it isn't what I was expecting. 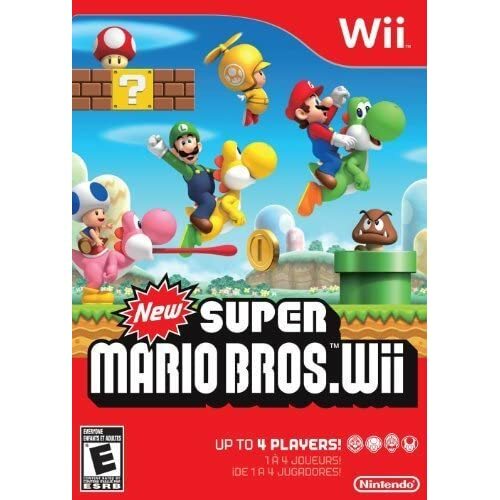 I bought this game for my niece for her wii and she absolutely loves it. She's had nearly everyone in the family play along and we've all had a good laugh and have gotten some good exercise. The only this is that some of the moves are a bit suggestive as well as the outfits of the characters in the game. Not to mention the song lyrics themselves. 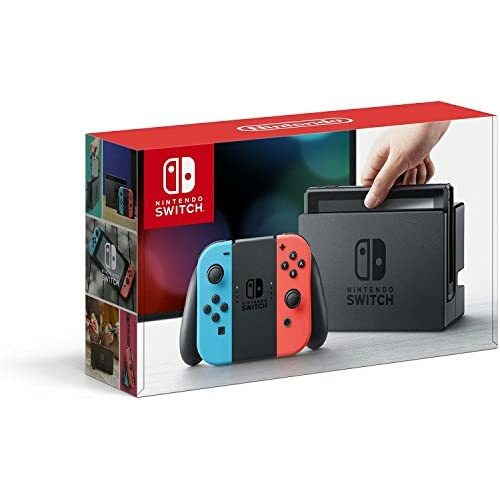 I know it's 2015 but my neice is 4 and it required alot of supervision for a "family" game...Overall, I would recommend it, it's alot of fun and I got it for a steal here at Amazon for $19. If you love dancing, get it! Fun game! Has a great song selection, would definitely recommend! The Price is Just Right. A completely new experience from the other Just Dance games I own. 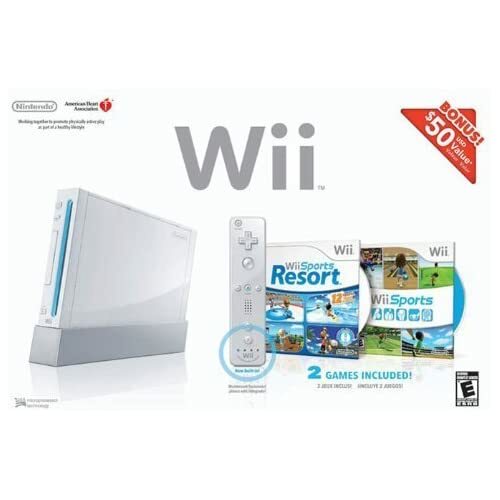 Right off the bat, my extra old wii console demanded I update before I could even play this game. I knew then, "This is going to be worth all the money...every dollar. But not the shipping, because not even a sorcerers stone would be worth $5.00 shipping. Seriously." It is a little bit laggy when it comes to the menus and song selections, and I'm not a huge fan of the locked controls, but aside from that, this is a pretty good game from what I can tell. Wife loves it. Great songs and she can really work up a sweat dancing to a dozen songs. Wish I could combine all the songs you enjoy from previous years for her. That way she wouldnt have to scroll through the crappy songs no one dances to or have to change discs to get a throwback dance. I definitely recommend this series of games to anyone looking to have some fun and burn some calories in the process.